Every time I block something, specially something lacy, I feel like Merlin performing magic. The magic of blocking never ever ceases to amaze me. It's the magic of turning a lumpy pile of what looks like bad knitting into something beautiful, often times extremely intricate, and frequently twice it's original size. Like I said, the magic of blocking always amaze me. It didn't double in size, but almost. Pre-blocking it measured 12 inches up & down at the center back and 31 inches across. Post-blocking, it's 19.5 inches top to bottom at the center back & 44 inches across. Don't you just love it? 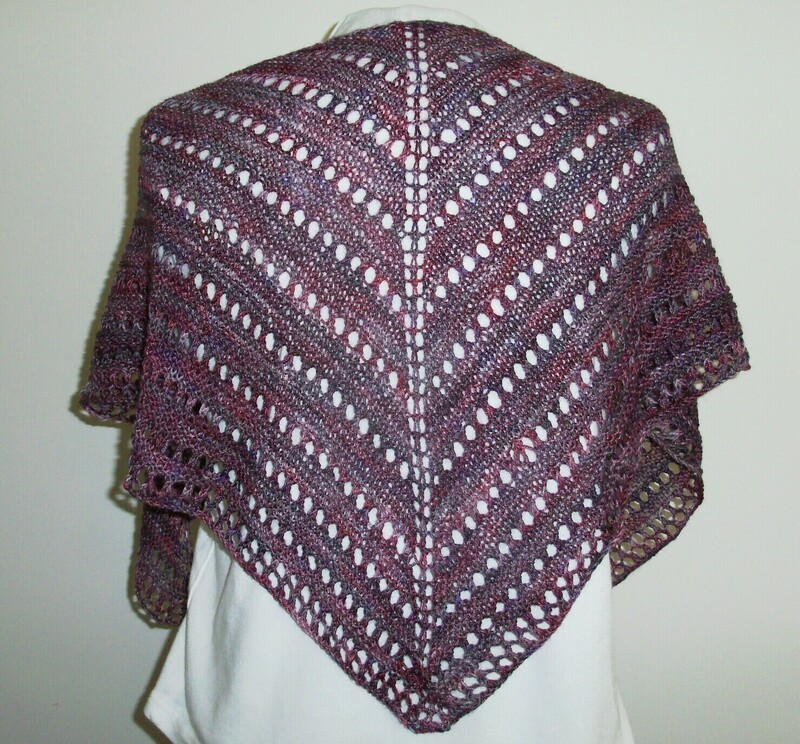 The pattern is WendyKnits' Summer Solstice KAL. Seeing as though the KAL started in June and I'm just getting around to finishing it, I don't think I have to worry about issuing a spoiler alert. 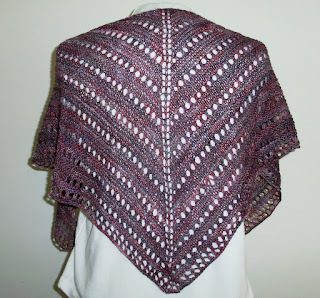 I used KnitPicks Palette yarn in the Calypso Heather colorway and a #5 needle. Once again, I have to say how much I love WendyKnits' patterns. I'm not sure how many of her patterns I've knit, but I know I've knit more of hers than any other designer and I've never found an error. And on those occasions when I've suffered an Alzheimer moment and couldn't figure something out, I emailed her & she responded right away. Wendy's patterns also just seem to make more sense to me. I have no idea why that is. They are all written in the same basic knitter's language and use the same basic chart symbols, but for some reason, Wendy's patterns just work better for me. Meanwhile, while I anxiously await 1 p.m. and the start of the Redskins season. The pork is on the smoker, the baked beans are in the oven and I'm busy knitting pink things to list in my Etsy shop in honor of breast cancer awareness next month. The official football season kicks off this Wednesday with the Cowboys playing the Giants. My Redskins don't play until Sunday, and to celebrate I've decided to offer 10% off in my Etsy shop the week following a win. The offer will stand all season and will run the day after a win through Friday. Just use the coupon code, "Redskins" to get your discount. Another exciting Etsy announcement is that Etsy is now offering gift certificates. You'll need to pay with a credit card rather than Paypal, but you can purchase the gift certificate & either print it to give away or email it to the recipient. The gift certificates will be good for any Etsy shop. I absolutely LOVE this one! It's a rectangular shawl or oversized scarf knit with over 30 different multicolored yarns, some in shades you'd never in a million years think would work together. The end result, however, is a blur of subdued color. This scarf is incredibly soft and the colors remind me of stained glass. This is another one that I had a hard time listing in the shop instead of keeping for myself. The photo is not doing this shawl justice. It's knit with a hand painted sock yarn in shades of plum, wine, burgundy and a light purple that looks more gray than purple. This is another project that I was tempted to keep for myself. If you are interested, all of the above can be purchased here, as well as a several other new items that have been recently added. Now, I'm off to go make my football grocery list. What will you be eating during the game?